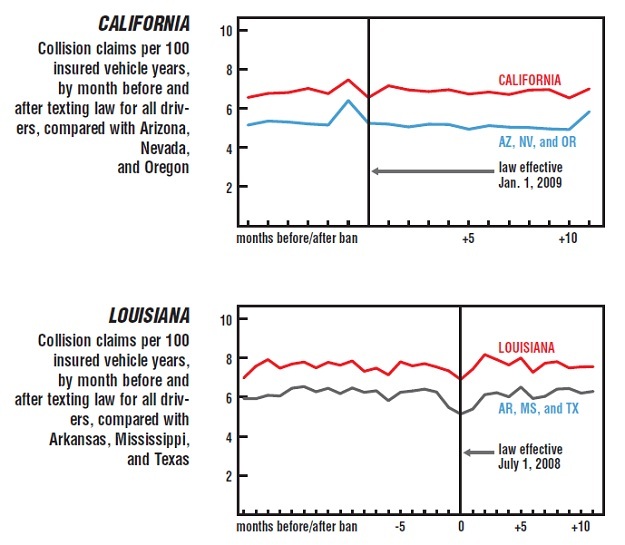 Today this trip down memory lane takes us to 2008, and the "distracted driving" law. You can read the disgusting legislation here. As an over-arching analysis, this is Nanny State legislation at its best, one of the most solid examples of Alison "Red" Redford's agenda -- the pussification of society. In this case, expanding technological improvement that promises to make our lives better is squelched by a a petty, autocratic regime that can't handle that millions of Albertans are bettered by these devices with a frankly miniscule number harmed by them. Of course, this law doesn't really help that: as we've seen in real-life on the roadways, the law fails utterly. Enforcement is a joke. More importantly, people like me with nice big pickup trucks are totally in the clear: no police vehicle is high enough up to see what I'm doing below the top of the steering wheel. I've texted at a red light (as I've noted on here before, such perfectly safe operations are inexplicably banned under this legislation) with a police vehicle next to and/or behind me. Even if they were looking to see if people were texting at the light (and they probably weren't) there was no way for them to see. Even at night my phone doesn't put out nearly enough of a glow to alert anybody. On the highway I've texted and talked and looked up on Twitter with impunity. Nobody's just going to catch it. And how many people have you seen texting or talking while driving? As I said, I'm high up in a way a Nissan Ultima is not. I've seen people using their devices constantly. No enforcement of the law makes it worse than not having one: a basic principle is that if you give people reason to scoff at and ignore laws, it does not speak well for society at large. Similarly, there are far more dangerous things on our roadways (unsafe lane changes, making left turns into the improper lane, driving too slow for the traffic conditions) that are routinely ignored by police for the same reason they ignore texting while driving: too much effort to catch anybody doing it. Meanwhile, things that are easy to spot (in the summer, I smell at least 2 vehicles a week emanating the smell of pot which isn't only illegal to use while driving but illegal in general) are similarly ignored. Police aren't interested in catching you doing anything other than driving faster than a random sign on the side of the road anyways, so why even bother? 7) How does this legislation balance the need for safety with the realities of multi-tasking that occur in day-to-day driving? Sometimes people forget that when you're in your vehicle, your primary focus should be on driving. We seem to treat our vehicles like a second living room, or a couch on wheels, or even a mobile office. That has to change. It's all about traffic safety. Make no mistake: You cannot drive safely when you're distracted. That has to change. No, Alison Redford, agent of the pussification of society, no it does not. The mobile office, and indeed the mobile personal communications terminal, is an advancement of the digital age. With new advances, drivers can be warned through the yegtraffic Twitter feed, Tom Tom GPS devices, messages from friends, the likes. Re-routing traffic from congested spots and areas is a boon to urban automobile transportation, and Red Redford's government through that all away in order to enact legislation of negative value that fails to even live up to its public policy goals. With modern technology, you can be asked to stop at 7-11 to pick the wife up some milk at the store, text your girlfriend to tell her you're going to be 10 minutes later picking her up because of traffic, and tell your buddies you can't go drinking with them tonighttp://www.blogger.com/img/blank.gifht because you've got to meet your girlfriend and pick up your wife. This is a great improvement to human interaction. Just last week I picked somebody up from a flight at the airport. Had I not discovered halfway to the Henday that she was at the City Centre Airport and not the one out in Didsbury I would have wasted my time and my gas money picking her up. All of that, of course, was illegal thanks to the disgusting legislation put out in 2008 by Red Redford's caucus. Was it anymore dangerous than putting an extra 64km of driving onto rush hour traffic? Almost certainly not, and once you add up the hundreds of thousands of such incidents across the province on a weekly basis, is it little wonder that such legislation fails? Fortunately, there is a way to punish the "Progressive" "Conservative" Party and Alison "Red" Redford for this (and other) bad pieces of legislation put out by her party since the dawn of the millennium: vote them out. There is a strong right-wing alternative: Danielle Smith's Wildrose Party of Alberta. No official traffic policy is yet available, but it's clear that if any party is going to be centered on the idea of returning Albertans their liberty on the highways, this is the one. We know that the Red Redford government isn't going to admit their wrongdoing (a habit they only seem to develop during elections, not while they have access to the levers of power), and I highly doubt the three even further left-wing parties are going to reverse the pussification of society. Nay, their every public policy proclamation has been revolutionary reforms that reduce rights relished fervently by Albertans. Red Redford is treating you like an errant child, telling you that you can't do something and then ignoring the societal collapse that comes with her abhorrent declarations. Will you put up with this? Or will you fight back on April 23rd? But one of the big exemptions you may notice is drivers who are dispatched. The immigrant taxi driver who's already a menace to the roadways? He's allowed to use a computer on his dashboard. The guy driving a delivery truck who's being paid to do so? He's allowed. You, the guy who's making a couple deliveries as a favour to a friend and need to get in touch with him? Yep, banished. Who else is a big technical abuser of this law (but conveniently exempt from it)? That's right, you're friendly neighbourhood corrupt police officer! Why do they get to use portable smartphones and dashboard-mounted laptops? Well, as Edmonton Police explained one day, they have taken special courses to ensure they can operate their vehicle safely. Can you, as a civilian, take this course and get an "electronic devices" endorsement similar to the airbrake endorsement already available? Uh, nope. Does this 'special course' mean that Edmonton Police are driving safer and with fewer accidents than ever? Uh, nope. So under Red Redford's administration, her own government agents are given a free pass while the citizenry that they are supposed to be equal to (and indeed serving) aren't? Well, unless you're working for one of the companies that has the energy and resource to fight this law in court and/or have an audience with the Premier. Then you get an exemption too. How about the sensible exemptions you want, like a minor change allowing you to comb your hair when stuck behind a train (which, as a point I've mentioned before, is a situation where you can close your eyes entirely)? Uh, nope.